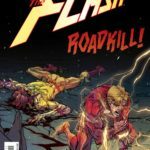 DC has released the preview for Batman #21, which is the first part of the upcoming Flash–Batman crossover, and you can see it at Comic Vine. The issue is out this Wednesday, and is part of a four-issue story titled “The Button”. And as you can see, it features the return of a long-missed villain. Planning to pick this up? What do you hope to see in the story? Share your thoughts! This entry was posted in Flash News and tagged Batman, Preview, Professor Zoom on April 17, 2017 by Lia. 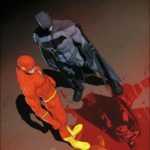 The upcoming Flash–Batman crossover “The Button” will begin next week, and DC’s released another telling cover from it. 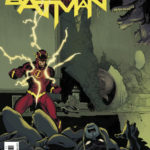 This one’s a variant from Batman #22, and features disturbing allusions to guest-stars Professor Zoom and Flashpoint’s Thomas Wayne (you can see the main cover for this issue here). 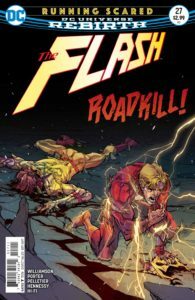 We saw at the end of Flash #19 that Professor Zoom’s alive and remembers the events of Flashpoint, including his death at the hands of Thomas Wayne. It’ll be interesting to see if he meets with Flashpoint Batman during the crossover, as he’s already expressed the intention of attacking his son. Plus, of course, there’s the mystery of the Comedian’s button which Barry Allen and Batman will be tackling. 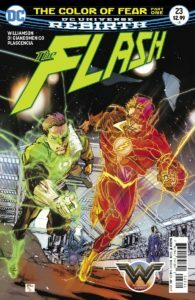 The crossover begins on April 19th with Batman #21, and continues the following week in Flash #21. 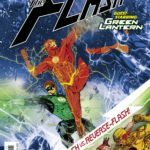 It will then continue in issues #22 of the Batman and Flash series. This entry was posted in Flash News and tagged Batman, Professor Zoom on April 14, 2017 by Lia.